Some time around the year 1413, a few years before the likely date of Julian’s death, Margery Kempe came to pay her a visit in her cell in Norwich (on which, see this post). To give you some sense of their relative ages, Margery Kempe was born around the same year (1373) that Julian had her first revelations, at the age of thirty. 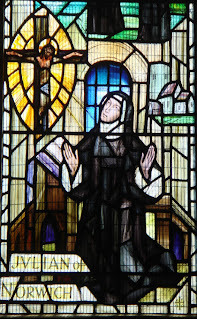 I think many of us would be glad to have the opportunity to talk to Julian of Norwich, although I like to think that if I was lucky enough to get that chance I wouldn’t do what Margery Kempe did – which was, not surprisingly, talk about Margery Kempe. 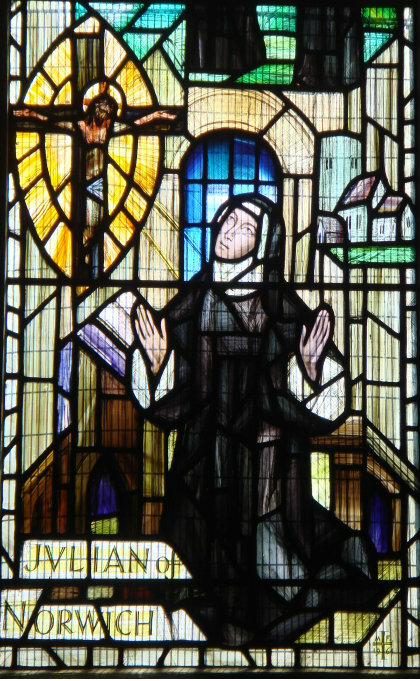 (To be fair to her, I suppose she had gone there for advice...) Kempe’s account of Julian’s words to her is suspiciously focused on the things Kempe was obsessed with, as a laywoman struggling to find validation for her own form of intense religion devotion: the importance of trusting to personal inspiration, chastity, the holiness of devout tears (Kempe was notorious for bursting into noisy tears during Mass, much to the annoyance of her neighbours), and counsel which essentially says ‘if people don’t like you, you must be doing something right’. The text is from here, and my translation follows. And than sche was bodyn be owyr Lord for to gon to an ankres in the same cyté whych hyte Dame Jelyan. And so sche dede and schewyd hir the grace that God put in hir sowle of compunccyon, contricyon, swetnesse and devocyon, compassyon wyth holy meditacyon and hy contemplacyon, and ful many holy spechys and dalyawns that owyr Lord spak to hir sowle, and many wondirful revelacyons whech sche schewyd to the ankres to wetyn yf ther wer any deceyte in hem, for the ankres was expert in swech thyngys and good cownsel cowd gevyn. Mych was the holy dalyawns that the ankres and this creatur haddyn be comownyng in the lofe of owyr Lord Jhesu Crist many days that thei were togedyr. And then she was bidden by our Lord to go to an anchoress in the same city [Norwich] who was called Dame Julian. And she did so, and displayed to her the graces that God had put in her soul of compunction, contrition, sweetness and devotion, compassion with holy meditation and high contemplation, and full many holy speeches and conversations that our Lord had spoken to her soul, and many wonderful revelations, which she told to the anchoress to learn if there was any deceit in them; for the anchoress was an expert in such things and could give good counsel. The anchoress, hearing the marvellous goodness of our Lord, highly thanked God with all her heart for his visiting, counselling this creature [Kempe] to be obedient to the will of our Lord God and fulfil with all her might whatever he put in her soul, as long as it was not contrary to the worship of God and the benefit of her fellow-Christians; for, if it was, then it was not the inspiration of a good spirit but of an evil spirit. The Holy Ghost never inspires anything which is contrary to charity; if he did, he would contradict his very self, for he is all charity. Also he inspires a soul to all chastity, for people who live chastely are called the temple of the Holy Ghost, and the Holy Ghost makes a soul stable and steadfast in the true faith and the true belief. And a man who is duplicitous in soul is ever unstable and unsteadfast in all his ways. He who is always doubting is like the flood of the sea, which is moved and borne about with the wind, and that man is not likely to receive the gifts of God. Much was the holy conversation that the anchoress and this creature had, communing in the love of our Lord Jesus Christ many days that they were together. to ask you if I can use two photos from your blog on the cover of book. 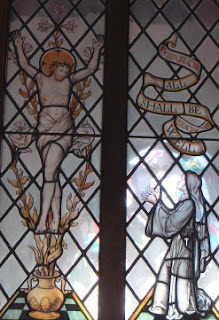 The book tells inter alia about Julian of Norwich. I would be glad if you agree! Came across your entry looking for images of Julian for a post on my blog. I have now put your blog on my RSS subscription list. You are learned and write beautifully.